I live on a cypress-fringed old river lake in the Arkansas Delta southeast of Little Rock. 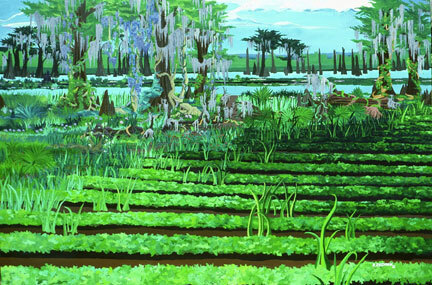 The luxuriant flora, the big sky over flat, fertile fields, the bayous, the swamps and great rivers have often given me inspiration for my paintings and drawings. I have an intense feeling for this land and its people  for example, when I stand under or touch an ancient cypress tree; when I think how very quickly Nature would reclaim this land and its waters were it not for mans interventions; or when I think of, and as I live, the human experience  both joyous and tragic  in the Deep South. My expression of these overwhelming emotions is through art. Because my work most often depicts Southern scenes, some might associate it with a sort of regionalism, which is fine for those who enjoy it on that level. (Obviously, I do, too.) However, it is my hope that the viewer may see, and feel, something in my work that is universal.